The BendPak Hush-Quiet rotary screw air compressor meets the compressed air needs of high-volume automotive shops and facilities around the world. This includes tire, general maintenance, fleet, vehicle body repair/modification shops, paint shops and dealerships. The asymmetric profile screw set is driven by a 7.5 HP electric motor and triple‐belt drive. Atmospheric air is drawn through the inlet filter into the asymmetric profile screw set, and this is where air is compressed. BendPak's specially developed PowerCool synthetic lubricant is injected into the screw set to serve three important roles: coolant, lubricant and sealant. Under normal conditions, the air reaches a maximum temperature of about 176°F / 80°C during compression. ​Then the dual‐stage separator removes any cooling fluid from the compressed air. The cooling fluid is recycled, passing through the cooler and micro‐filter, then all the way back to the point of injection. Meanwhile, the air compressor regulates and optimisesair and fluid temperature with a highly sensitive thermostatic valve. The air emerges from the separator cartridge with a ​total fluid content of less than 2 mg/m³ before passing through the minimum pressure check valve and, at last, through the after-cooler. In the after‐cooler, we further reduce the air temperature between 5 and 10 degrees above ambient. Most of the moisture in the air condenses here and is easy to separate and remove in the downstream centrifugal separator. Now the air can finally leave the air compressor through an outlet and be applied to any automotive job you need. BendPak's asymmetric rotor profiles with precision ground-lobe configuration to provide higher compressed air ​output without trading for higher power consumption. Each rotor is fitted with high‐precision bearings, allowing ​for a significantly increased air end life. Multiple shaft seals are also there to provide total protection from oil and other contaminants. Finally, toothed safety washers and a special locking nut ensure that the rotor tolerances are set throughout the life of the air compressor for improved reliability, stability and longevity. A specially engineered double‐shaft asymmetric profile screw set combines with a virtually soundproof, insulated enclosure, and our innovative cooling fan gives Hush-Quiet users an almost silent air supply at all times. With no parts to wear down, the Hush-Quiet offers ​superior reliability and significantly reduced maintenance costs. There are simply no piston rings, valves, rod‐inserts, bushings or pistons just waiting to fail, nor are there valves, valve plates or valve strips to service. With extended service intervals, you save time and money. ​Convenient service panels allow you to easily access all the necessary internal components for occasional servicing. All regular maintenance can be performed from the comfort of your own shop, at your leisure. Still, we do provide annual maintenance contracts for customers who prefer the assurance that their QRS air compressor is always operating at peak performance. Contact BendPak sales or customer service for more details. This is a big deal. Energy costs ​represent a significant portion of any compressed air system's total lifetime cost. In fact, the amount of energy required to run a traditional compressor for just one year can exceed the compressor purchase price! Over a period of 10 years, energy normally totals 70% of the overall costs. The efficient design of the BendPak Hush‐Quiet RS7580H‐603 rotary screw air compressor can reduce this burden significantly. Our easy-to-understand touch‐pad control automatically regulates and monitors ​the rotary screw air compressor via an industrial-​grade PC and real-time operating system. The four‐line, plain‐text display with touch keys and menu‐guided screens offers users clear function choices. At the same time, the controller manages the system​ by monitoring temperatures and pressures in order to protect your investment ​and ensure you extract maximum energy efficiency and performance from every single kilowatt you use. When designing the Hush-Quiet, we paid great attention to its ventilation and heat exchange system in order to guarantee excellent cooling​ in even the harshest environmental conditions. 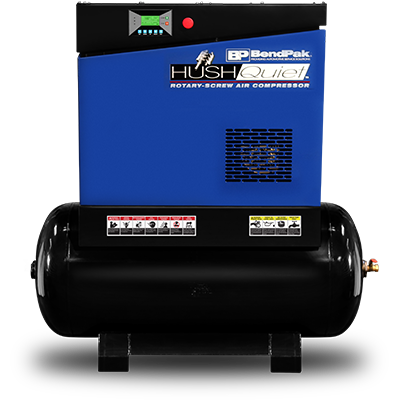 With efficient, high-capacity cooling fans and oversized cooling intakes and discharge ducts, the Hush-Quiet rotary screw air compressor surpasses even our own expectations, and we’re sure it will surpass yours, too. Efficiency and reliability are designed into the asymmetric profile screw set with excellent inlet flow characteristics.